As of this year, the Spoetzl Brewery (producer of Shiner beers), has been in business for 100 years. Since 2005, they have brewed a special anniversary beer each year as part of a countdown to the century mark. I don't know if it was planned or not, but each beer so far has been a member of the Lager family. The first in the series was Shiner 96, a Märzen (or Oktoberfest) style beer, that I regret dearly that I missed my chance to try. Shiner 97, a Schwarzbier (and my favorite so far), was popular enough to earn a spot in the regular Shiner line-up as Bohemian Black Lager. 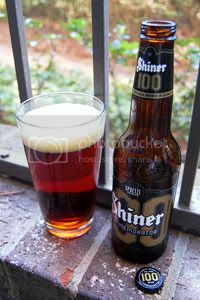 2007 saw the release of Shiner 98, a Vienna Lager and the most successful of the collection yet. Last year we got Shiner 99, a bright Munich Helles Lager. I still have a few bottles of 97, 98, & 99 in my collection. I might review these later as cellared versions, I know that the 97 is holding up well. This year, for their centennial, they've brewed up a Doppelbock named Commemorator. Makes sense when their flagship beer is Shiner Bock. Shiner say that Commemorator is "brewed in the robust classic German 'stark' style and it embodies the Old World heritage and tradition Shiner had proudly stood for since 1909." There's been quite a build up to this, let's hope it can live up. Appearance: Reddish brown crystal clear body. Bubbly off-white finger high head that disappears quickly, leaving hardly any lace. Looks very much like the flagship, Shiner Bock. Aroma: Not particularly intense. There's some sweet malt, with weird metallic tones. Taste: Sweet, slightly caramelized malt is the bulk of the flavor profile. I'm still getting some of that weird metallic taste, but that's almost expected in a darker Shiner beer at this point. There's really nothing from the hops to speak of. Everything is just a little on the thin side, but it's not a major concern. The aftertaste is of rich malt and notes of booze. Mouthfeel: Medium-body with lots of carbonation. Boozy in the finish, but not dry. Drinkability: Solid enough with a mild profile and the near seven percent alcohol hidden well. Verdict: I have to say I'm a little disappointed with this as the big finale. While Commemorator is a good beer, it's not really anything special compared to the rest of the anniversary collection. Perhaps my expectations were a little high, but we have been building up to this beer for five years now. Shiner 97 is still, by leaps and bounds, my favorite of the Shiner anniversary brews. Here's hoping for 101! The style of the 100 Shiner Commemorator brew is a Double Bock as told to me by Peter Takacs, their Lab QC Manager. I took a tour there earlier this month and earned an extra trip upstairs to the lab because I gave them a brown ale I had made. Wished I could have gone to the third floor where the grain mill is so I could bring some of that back home with me! I also am a bit dissappointed in their commerative brew but it makes sense that they made a stronger version (6.7%) of their most popular style - Shiner Bock. My favorites are the 99 (Munich-Style Helles Lager)and the 96 (Marzen-Stlye Ale). That 97 Black Lager is not too shabby either! Unfortunately I never ran into any of the 98 (Amber) and it is no longer available. Thanks for the info! If someone from the lab says its Double Bock, that's good enough for me, I'll edit the review to reflect that. By the way, I may have 2 cases of 98 in my hall closet. If you're really looking to find some I'd be happy to share. I have a sixer of each of the commemorative brews here at home. I always save for the collection. Wouldn't the beer be bad by now if I were to drink one? I mean, wouldn't a 96 taste terrible after 5 years? With all of the Shiner anniversary brews being relativity-low ABV beers, I would assume that after 5 years they'd probably have deteriorated quite a bit. Especially if not kept in cellar conditions: no light and ~55 degree temperatures. Read more here. Shiner did a bang-up job of confusing everyone about their 100 Commemorator. It's an ale "brewed in the Doppelbock tradition." Doppelbock is a lager style, not an ale. Very confusing. I think I will stick to my favorite Shiner product, the Bohemian Black Lager (97 Anniversary Black Lager). Shiner 97 is my absolute favorite Shiner release.